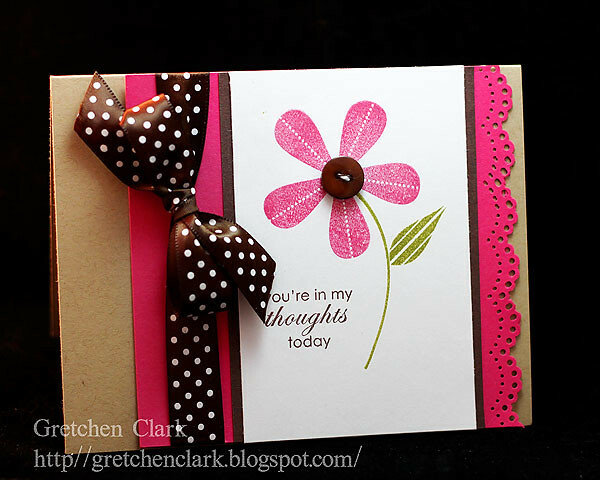 Hi friends~ I am popping in quickly again today with another clean and simple (masculine) card. 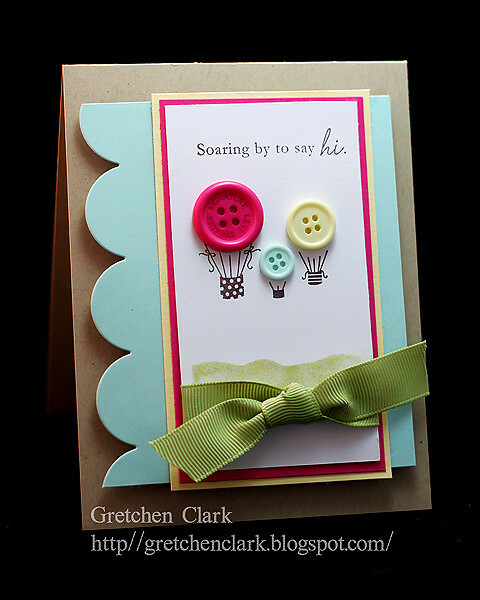 As you know I always struggle with guy cards~but as long as I can add a button, I am usually ok, LOL!! I am so excited I am will be making a (long overdue!!) Papertrey Ink order later today *woot woot*~my wish list has grown sooo long that I am really going to have to prioritize my shopping cart!!! Here are a few of my current fav's~ this, this and this, but I have been know to change my mind at the last minute, LOL!! I will let you know what I choose once I make up my mind :) Have a fabulous "middle of the week" day!!! Hi all, I hope you had a fabulous weekend!!! Mine was pretty busy~I never got to my grocery shopping (which is one of my least favorite jobs!!). Hopefully today after work I will get it done (unless I talk myself out of it~which I have been known to do, LOL!!). My family celebrated my birthday yesterday~and I have to say that I was so proud of them!! They even did a theme (I think I am rubbing off on them, LOL!!). After lunch, cake and presents~I was pooped!! I guess that is what happens when you get old (er). I got lots of gift cards to some of my favorite shopping spots, here, here , here and here. I predict some retail therapy is in my VERY near future!!! 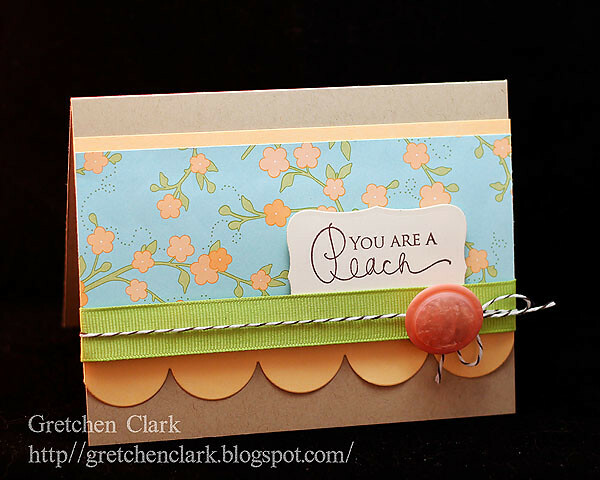 Luckily I did have a few moments to whip up a quick card for my blog today *smile* I was in a very minimalist mood last night, I was going to do some sort of background stamping on the Hawaiian shores cardstock, but changed my mind. 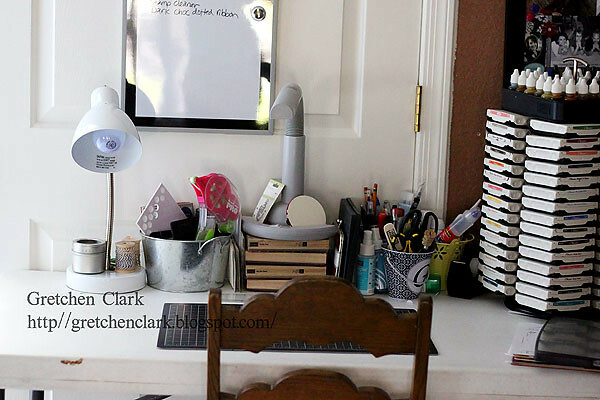 Once I put it all together I was happy I left it plain~sometimes "less is more" (one of my favorite sayings, LOL!). Ok friends...Enjoy today!! I hope you don't mind but I am going to be on a Thank You card making kick for the next few posts (since I have so many friends who bless me so!!). Here is a quick card I made for a sweet family from church that surprised me with a delivery, to my office yesterday (for my birthday), with some yummy goodness from here ~I ate half the box when I go home. Tonight I am off for a pedicure and a treat from this place. I seriously am going to have to eat salads for the entire month of April, LOL!! Ok enjoy your weekend peeps!!! Camera: This is the camera I am currently using, however, I am a firm believer that it is not the camera that gives you better photos!!! A point & shoot will work just fine. start off by learning how to use your camera (I used the auto button for years before learning how to operate my camera), Now I shoot in manual, which give me much more freedom and flexibility than automatic. If your camera has a manual setting I encourage you to play around with it and learn how to shoot manually. This class helped me tremendously!!! White Balance: the definition of WB is right here. This feature is usually under the menu options on your camera. Because different types of lighting give off different color it is important to set your WB on your camera (this is the reason why some photos look blueish or yellow). Most of the time auto is fine, but if I am using artificial lighting I will usually change it. Settings: Use the Macro setting (or Manual) on your camera (Macro is indicated with a flower symbol, Manual is indicated with an M), for close up photos. Make sure to focus on the center of your image and keep your hands as still as possible to avoid blurry photos. I tend to fill the frame of my camera with my image (less to crop later). Take a few photos, even if the image looks good in the live view (sometimes that little view can be deceiving). 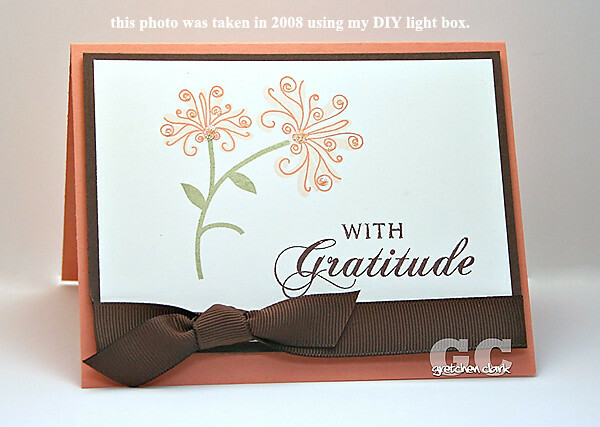 Lighting: Natural lighting is always best, but lets face it, a lot of times I am photographing my card at 8pm at night. 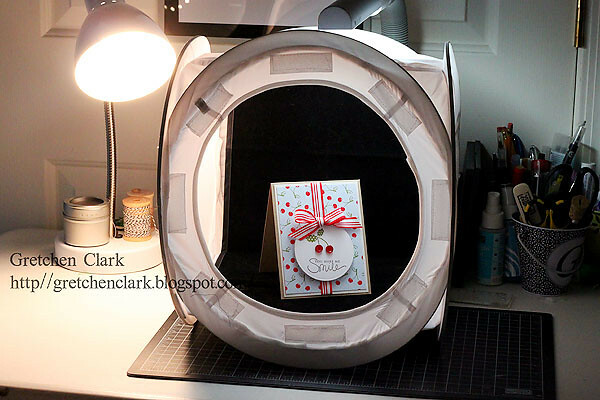 I use this light box, but for the first 2 years of blogging I used a DIY one, instructions are here. Make sure your image in not in direct light to avoid shadows. Once you find a setting and lighting situation that works well for you~use it all the time to keep the consistency in your photos. 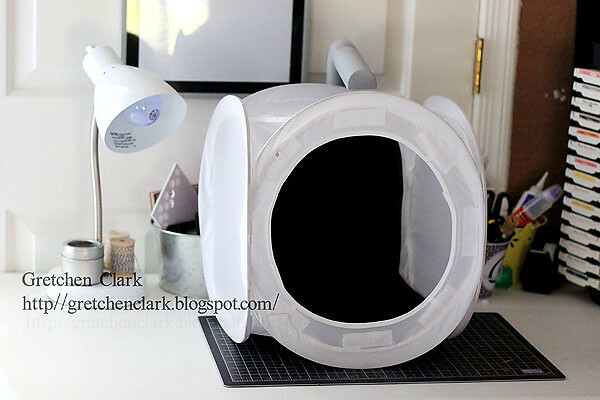 light box (I keep my lights in the same position always~which makes it easier to get the consistant lighting I want). Backgrounds: Choose a background for your item that will "pop" your image. I personally like black, but that is just my preference. Think contrast!! 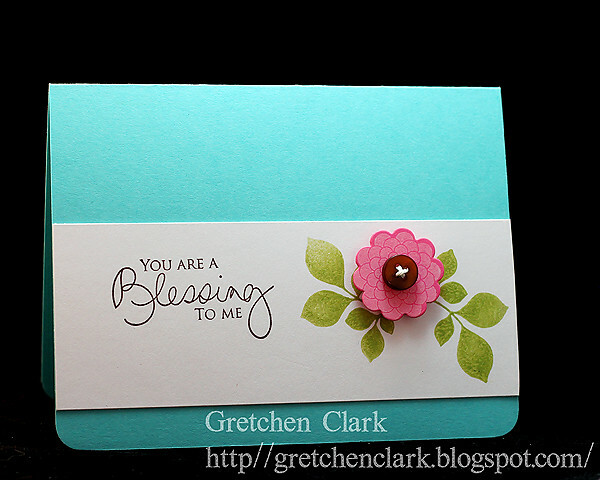 You want to stay away from background colors that are similar in color to your card, which makes it hard to see. Other tips: Take photos from various angles, top or side. And take lots of photos. I usually find that out of 5-10 images, I usually have one that is "blog worthy", meaning it is in focus and the color looks good. Editing: I currently edit my photos with Photoshop CS4 (if you have a student, of any age, in the house you can get it at a huge savings here.). I originally started off with Elements (Elements 4 to be exact), and that is a great program as well. There are also free programs out there that I hear work great, like this one. Once I upload my photos into CS4 I usually always adjust the brightness and contrast to my liking. Once I get my photo looking the way I like, I crop it (I usually do an 8x10 crop, because I like the square shape). Then I watermark my photo (I made my watermark into a brush, which is kind of like a stamp, in Photoshop then I just stamp it onto my image, instructions are here.). Then I sharpen and resize my image for the web. Sharpening: photos for web viewing usually requires sharpening and resizing. I use an action that I LOVE!!! (action-is a series of steps recorded in photoshop~like a shortcut, that you load into the program and hit play and let it do the work for you). 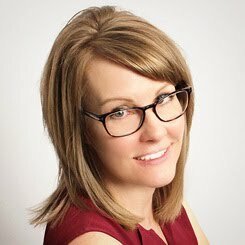 The action I use is called Heidi's resize and sharpen, which is a free download, but the only way to get it is to become a member of the http://www.ilovephotography.com/ forum (which is also free to join). If you have Photoshop or Photoshop Elements and want to download the action, sign into your account at ilp and then find the link here. This action will also resize your photo to 72 dpi so the file does not take forever to upload and cannot be printed. Flickr: Once my photo is sharpened and resized, I upload my photo to Flickr and copy the large file size html code for my blog, then paste. Step by step tutorial here. Remember: Taking good photos is a learning process (which I am a student), Enjoy the learning process, of course it is natural to be frustrated (luckily digital photos can easily be deleted and don't cost anything to take)~but if you stick it out you will be rockin' that camera!!! I have been super swamped with graphic designing for my church, so I have not had any time to stamp *insert my sad face here. * I am hoping to have my Card Photography HOW-TO post up later today or Thursday. 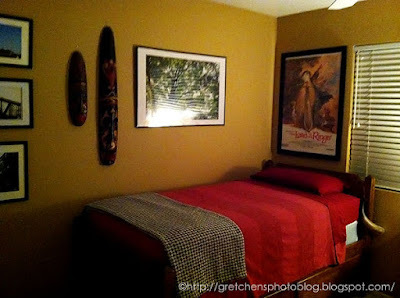 I did get Josh's room cleaned on Monday~so I was very happy about that accomplishment!! I took a quick photo with my iPhone before I went to bed~cause I was afraid that it may not look this clean on Tuesday, LOL!! Josh was happy with the end result~and so was I!!! Did you happen to catch the Super Moon on Saturday night?? My photos did not come out as planned!! You can read about my failed attempt here. My photo shoot however went pretty smoothly~which is always good *smile* I will hopefully have some photos up on my other blog some time in the next week or two. Here is a quick card I made last night~I pulled out some really old SU! designer paper (do you remember this one??). I had a little problem in the past~I used to hoard my designer paper terribly (don't judge me, LOL!)!! I finally realized that there is always bigger and better stuff coming out~so just cut it!!! It feels nice to actually use some of it, LOL!!! I also pulled out my Everyday Button Bits stamp set (which hasn't been inked up very much lately). 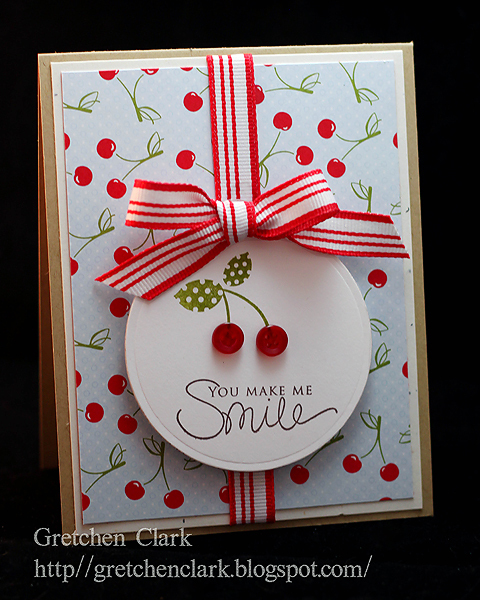 I call this my smile card with a cherry on top (cheesy, I know, LOL!!). I have today off~and I am hoping to re-arrange/(somewhat organize) Josh's room (yes, he is aware of this, LOL!). Wish me luck!!! Did you celebrate St. Patty's Day yesterday??? I made this for dinner~which was really yummy!! I cannot remember the last time I fixed this meal~because both Ashley & Josh didn't know what corned beef was, LOL!! I am doing a baby photo shoot tomorrow~which I am excited about!! I hope he is a smiley guy, cause sometimes those little ones can really make you work for that smile!!! I am driving to Peoria (and bringing one of my favorite assistants, aka-Ashley). I am thinking that we may stop here on the way home!!! 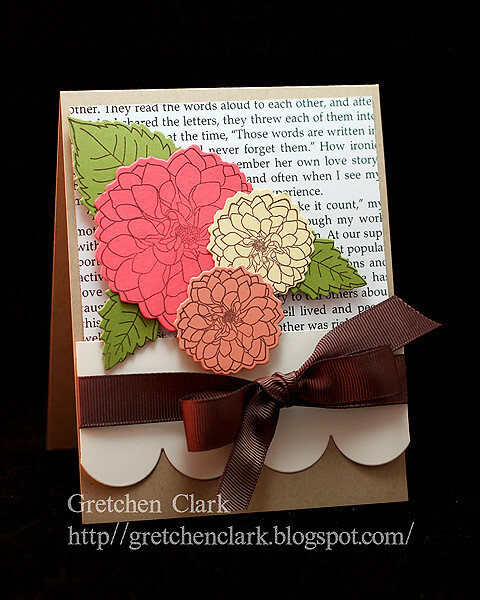 Here is a quick card I made Wednesday night while Mike stepped out for a meeting...I ripped a page out of an old book for the background~and was thrilled with the result ;) I am sure there will be more book page backgrounds in my card making future, LOL!! Random cleaning product chit chat: I ordered some of this last week, I have heard lots of good things about the products and have been doing my research. I mixed up 3 separate bottles: for windows, all purpose, de-greaser; since I have not really had much time to clean (hopefully over the weekend), I am anxious to try it out!! Can you believe the window cleaner only needed 2 drops of cleaner for 16 oz of water, the all purpose cleaner used 1/4 of a tsp for 16 oz of water and the de-greaser used 1 1/2 teaspoons of cleaner to 16 oz of water, (I will NEVER run out of this stuff, LOL! so I hope I like it). 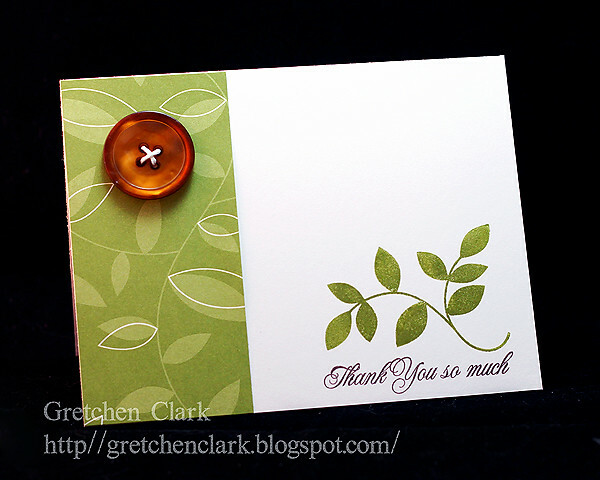 Here is a little card I whipped up last night...I cannot believe I had a few moments to stamp...probably because I didn't go for my power walk (oh well, there is always tomorrow, right?). Stamping was way more fun than walking!! Have a Terrific "middle of the week" day!!! The weather has been so nice here in Phoenix, can you believe it will be 90 on Wednesday?? It is starting to heat up in the desert! I talked to my mom on the phone yesterday; and CT is even starting to warm up (it was 45 when I talked to her at 3pm). I know they have had a hard winter and spring is greatly anticipated. Wish I could send some of our warm weather. Ashley and I went to IKEA on Saturday~I LOVE that place!! We both ended up getting new duvet covers, this is the one I got, and Ashley got this one. I also picked up this little guy for my night stand, and some of these for my kitchen table. 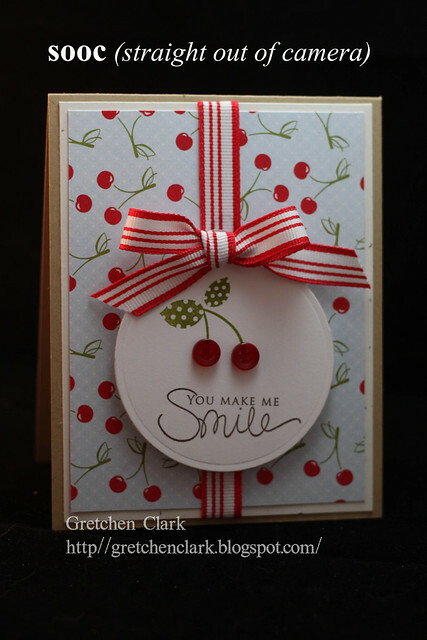 Here is a quick card that I put together last night; inspired by this one, by Maile Belles. 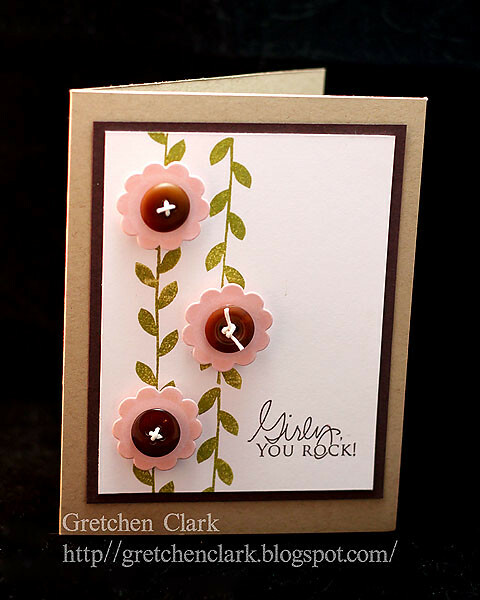 Have you seen her new stamp set?? At first glance, I wasn't sure if I really liked it~but now that I am seeing all the possibilities~it is on my "ever growing" wish list!! Happy 'TGIF' friends!!! I am ready to get the weekend started *woot*. Do you have anything fun planned? I am meeting a friend that I have not seen in quite a while over coffee this morning, which will be fun!! And Mike and I are meeting up with a couple from church tonight, also for coffee (I think I will have my Starbuck's fix for today anyway, LOL!!). I will probably try to be good and order one of these, but I may easily talk myself into this; and for the record...have you seen these?? (I wonder how many points those are?? ), don't they look yummy? I haven't played along with the Clean & Simple sketch challenge for a couple of weeks, so decided to give it a whirl (here is this weeks sketch). I pulled out some retired SU! paper and went to town. I am definitely feeling the need to make a PTI order!!! Have you seen the sneak peaks?? SUPER CUTE!! I am seriously going to have to get another job to support my habit, LOL!! First and foremost I want to give a big shout out to Jen for her sweet comments about my blog in the PTI forums *big smile* I woke up to so many comments on my blog that I was on cloud 9 all day~thank you everyone for leaving me some blog love!!! I am feeling so BLESSED!! I hope I don't disappoint, LOL!!! 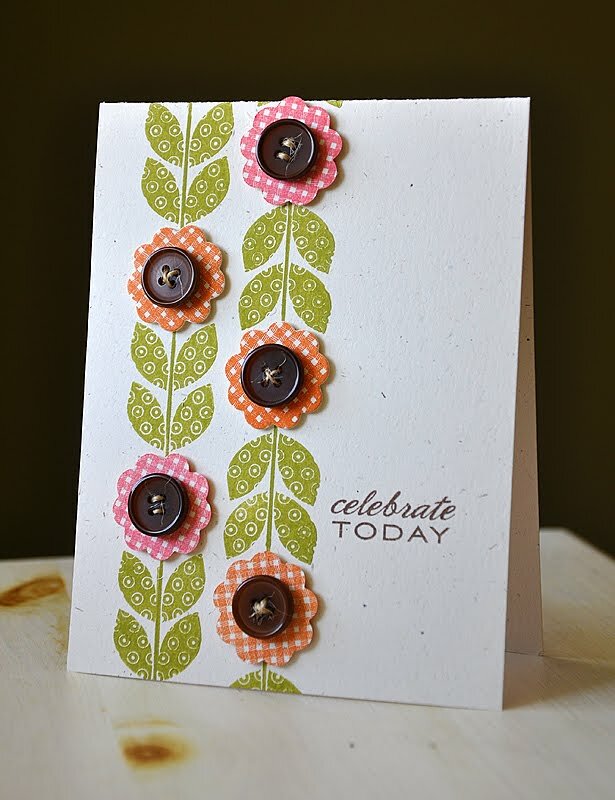 Here is a quick card that I whipped up last night; since I have not used my Everyday Button Bits stamp set in quite a while, I decided to ink it up!!! I needed a card for a high school friend of mine that I reconnected with recently thru Facebook (I love that site for that very reason!!). Since she lives far away from me~I thought the balloons would be the perfect image for the card. And for some randomness...Yesterday Ashley called me and said her car would not start, since I was close by, I said I would be right over (glad I have jumper cables in the back of my vehicle). Usually Mike or Josh do that sort of thing for us girls; But Josh was working and Mike was in a meeting. I have seen it done numerous times and, it was really pretty easy!! Thank goodness!! I followed her to the auto parts store, where they tested her battery~it needed to be replaced; but thankfully it was still under warranty *woot*. The guy came out and put it in for her while we supervised, LOL!! We chatted about how awkward we felt in an auto parts store/parking lot~kinda out of our element. Thankfully, we girls took care of it all on our own!! We were feeling pretty liberated!! Make today a great one!! I hope you had a fabulous and relaxing weekend!!! What a wonderful weekend I had!! My to-do list really got ignored, but that is ok!!! Saturday Mike and I took the kids out for brunch (I cannot remember the last time my hubby was home on a Saturday~he usually cleans the church and works on the power point for our Sunday services). The women's ministry volunteered to clean the church and give him a Saturday off (what a blessing!!). The weather was beautiful and we enjoyed a very late breakfast on the patio of Mimi's Cafe (Nate had to work *sad face here*). Of course I had my phone with me, and YES!! I snapped pic's, LOL!!! Sunday our church surprised Mike and I with a wonderful gift!! A retreat and lots of other goodies...we are still on Cloud 9!! Feeling so blessed by our loving church family!! They ROCK!! 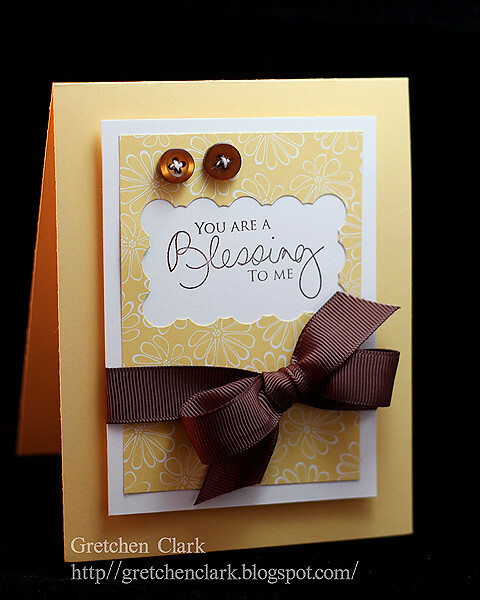 I had a few moments to play in my craft room/studio last night~and since I was feeling so blessed~I made a "blessing" card. Do you have any exciting plans for the weekend?? Mike and I are going out to dinner with some friends from church~always fun!!! Then the usual weekend stuff. I hope to get a head start on my Picture Inspiration lesson; last week I really procrastinated (probably because it was to do a self portrait~which is always hard!!! I like to be behind the camera, LOL!). Here is a card I forgot to post last week!! I am really loving the pastel spring colors (aqua mist is my all time fav!!) 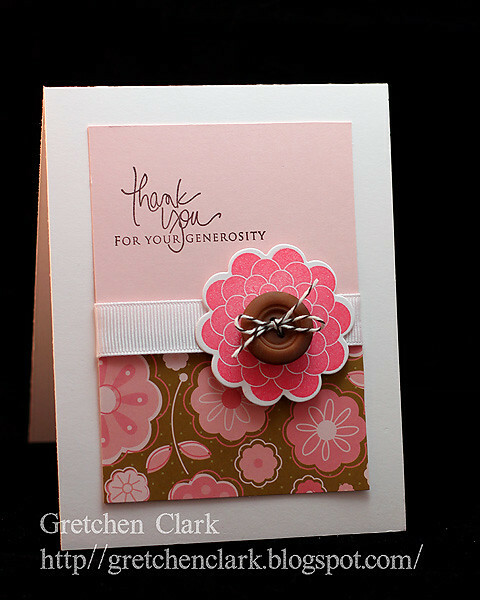 :) and of course I used one of my favorite stamp sets. Enjoy today my blog Friends!! Today is going to be quick...Friday night Ashley came over to do some crafting, and I had quite an incident with my glue gun (ouch!!). I seriously think I got 3rd degree burns~(I am a tough crafter, LOL! ); so now that the first layer of skin has peeled off (gross, I know! ),~I have several band aids on my finger which makes it hard to type (you should see my text messages, LOL!!). Luckily the burn happened at the end of the night so we were able to complete the project (which I totally forgot to photograph...most likely because my finger and hand hurt so bad, snapping photos was the last thing on my mind, LOL!!). I will definitly have to go over to her house and snap a photo~cause it was a super cute project!!! 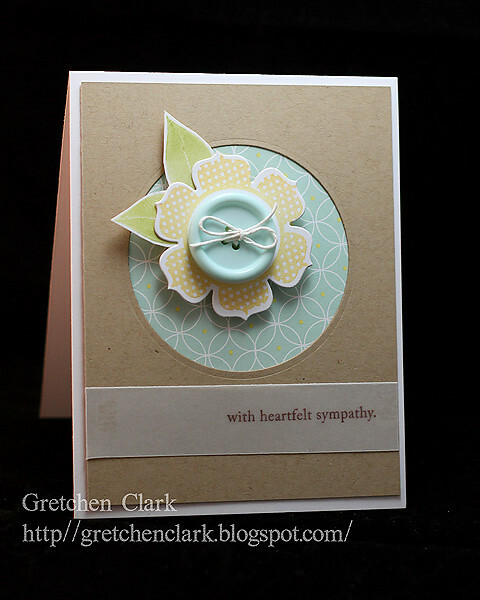 Here is another quick and easy card...I really do LOVE PTI dies!!! My wish list is a mile long *smile. 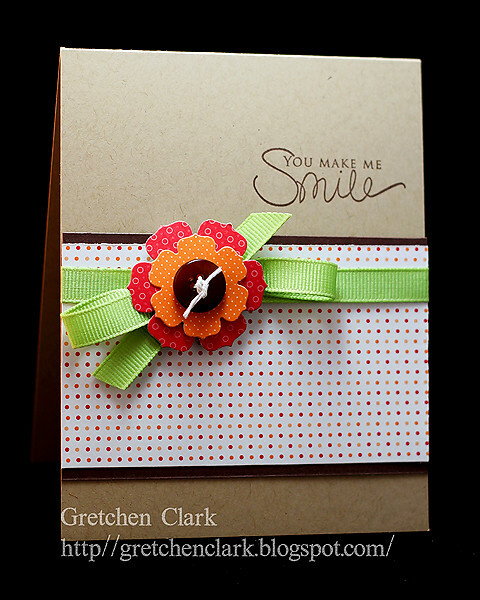 * This flower from Beautiful Blooms II is one of my fav's! !